Julian considers it a real honour and privilege to conduct the Isle of Man Choral Society. He has held this position since 2007 when the late Pam Duchars stepped down from that role. He studied singing, piano and organ, harmony and counterpoint, choir training and conducting and was a member of the Royal Choral Society, before moving to the Isle of Man in 1977. Soon after he became organist at St Ninian’s Church, Douglas where he has played for 39 years. He is a member of the Association of British Choral Directors. In 1979 he became chorus master of Mananan Opera. In 1980, he became Musical Director of Manx Operatic Society. Since 1977 he has conducted over 40 musicals at the Gaiety Theatre, Douglas. Since then, he has sung with Island Opera, the Manx Operatic Society and the Douglas Choral Union and has directed the music for shows put on by the Manx Operatic Society, the Douglas Choral Union, the Manx Gilbert & Sullivan Society, and Taylorian Productions. From about 1985 he has supported young people learning and playing brass instruments. Currently the official accompanist for all Brass Classes in the Manx Music Festival, (“Guild”) with which he has been connected for over 32 years. He prepares young people from Manx Youth Brass and Manx Concert Brass for their Associated Board Exams. Assists with musicality and aural tests and accompanies for examinations. Similarly, he prepares brass players for Young Musician of Mann Competition and has accompanied them since 1991. The impact from his contribution to the Manx music scene is mostly seen in the standard of young brass players. Each Saturday morning, he coaches young players who then move onto Manx Youth Band and later to Manx Concert Brass under Director of Music Ian Clague MBE. 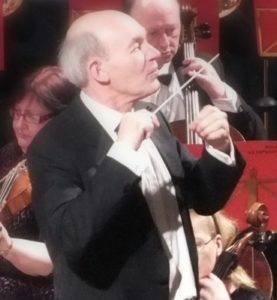 After being Deputy for five years, he became Director of Music in 2007 of Isle of Man Choral Society which produces a concert each year supported by Isle of Man Symphony Orchestra. In the last seven years, he has been the official accompanist for Glenfaba Chorale. His contribution to choral singing is enormous. Since taking over as Director of Music of Isle of Man Choral Society the Society has sung: Verdi: Requiem, Webber: Requiem; Parry: I Was Glad; Brückner: Te Deum, Dvořák: Stabat Mater; Fauré: Requiem, Mozart: Requiem; Vivaldi: Gloria, 1953 Coronation Music incl. Parry: I Was Glad; Walton: Te Deum, Brahms: Ein deutsches Requiem, Poulenc: Gloria; Jenkins: The Armed Man, Handel: Messiah, Rutter Requiem and Gloria, Mascagni Easter Hymn and Mendelssohn’s Hymn of Praise [second symphony]. His influence is such that the Isle of Man Symphony Orchestra looks forward to accompanying the Choral Society in its annual concert. His reputation encourages soloists based in the UK to come over to Isle of Man to perform with the Choral Society and the orchestra. There are many small choirs in Isle of Man of which Glenfaba Chorale [mentioned earlier] is one. However, Isle of Man Choral Society now has 150 members performing huge classical choral music. Other choirs do not have this capacity and concentrate on different genres of music. Such is the size of the choir that together with the orchestra, the only venue able to accommodate a concert with these numbers in Isle of Man is the Royal Hall, Villa Marina, Douglas. His contribution to the Isle of Man choral singing genre is such that the annual concert is virtually fully booked each year which is a rarity for any amateur musical production in Isle of Man. A measure of achievement is at the end of The Armed Man in 2014 there was a pause of almost twenty-five seconds when the applause started and continued for nearly two minutes. Also in 2016 the audience burst into applause at the end of the Hallelujah Chorus which, as you know, does not end the Messiah. The young brass players and many singers who have performed under him and progressed to better things all owe him a great debt of gratitude. Julian was honoured in the Queen’s New Year Honours list [January 2018] with a British Empire Medal [BEM] for services to the community in Isle of Man and especially for his many contributions to the music scene in the Island.